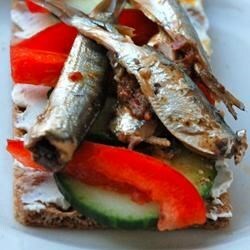 "Fresh sardines are fried to a crispy golden brown, and drizzled with a garlic and white wine vinaigrette then topped off with a sprinkling of fresh mint leaves. Serve this appetizer with a good white wine." Prepare the sardines by removing the heads and back bones. Rinse and pat dry. Dredge in flour, shaking off any excess. Heat olive oil in a large skillet over medium-high heat. When the oil is hot, fry the sardines a few at a time until brown and crispy. Remove to a large serving plate, and keep warm. In another skillet over medium heat, heat a bit of the oil. Add garlic, and cook for about half a minute. Add the wine and vinegar, and allow the mixture to simmer, stirring occasionally. When the liquid has reduced by about half, pour the sauce over the sardines, and sprinkle with fresh mint. Let stand for about 1 hour before serving to allow the fish to marinate. Tasted great but I couldn't forget the image of the fish heads. Followed the recipe to the letter and although this was a very nice dish I felt it called for a bit too much vinegar. I think I will only use a 1/2 cup next time.